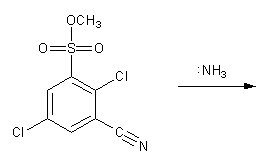 Draw a mechanism for the nucleophilic aromatic substitution (SNAr) reaction below. Show all resonance forms of the intermediate. For SNAr to work you need to have electron withdrawing groups (EWG) either ortho or para to the leaving group. This molecule has two leaving groups (chlorines), but only one chlorine has EWG ortho/para to it. So that's the carbon where the nucleophile (NH3) will attack. Why do EWG need to be ortho/para? Because that's the only way for the negative charge to be stabilized by resonance. Try it- if you have the NH3 attack the other carbon with a chlorine, you will not be able to draw a resonance form that places the negative charge on one of the EWG. MendelSet practice problem # 612 submitted by Matt on July 10, 2011.